Jose Mujica, President of Uruguay, a 78-year-old former Marxist guerrilla who spent 14 years in prison, mostly in solitary confinement, recently visited the United States to meet with President Obama and speak at a variety of venues. He told Obama that Americans should smoke less and learn more languages. He lectured a roomful of businessmen at the US Chamber of Commerce about the benefits of redistributing wealth and raising workers' salaries. He told students at American University that there are no "just wars." Whatever the audience, he spoke extemporaneously and with such brutal honesty that it was hard not to love the guy. Here are 10 reasons you, too, should love President Mujica. 1. He lives simply and rejects the perks of the presidency. Mujica has refused to live at the Presidential Palace or have a motorcade. He lives in a one-bedroom house on his wife's farm and drives a 1987 Volkswagen. "There have been years when I would have been happy just to have a mattress," said Mujica, referring to his time in prison. He donates over 90% of his $12,000/month salary to charity so he makes the same as the average citizen in Uruguay. When called "the poorest president in the world," Mujica says he is not poor. "A poor person is not someone who has little but one who needs infinitely more, and more and more. I don't live in poverty, I live in simplicity. There's very little that I need to live." 2. He supported the nation's groundbreaking legalization of marijuana. "In no part of the world has repression of drug consumption brought results. It's time to try something different," Mujica said. So this year, Uruguay became the first country in the world to regulate the legal production, sale, and consumption of marijuana. The law allows individuals to grow a certain amount each year and the government controls the price of marijuana sold at pharmacies. The law requires consumers, sellers, and distributors to be licensed by the government. Uruguay's experience aims to take the market away from the ruthless drug traffickers and treat drug addiction as a public health issue. Their experiment will have reverberations worldwide. 3. In August 2013, Mujica signed the bill making Uruguay the second nation in Latin America (after Argentina) to legalize gay marriage. He said that legalizing gay marriage is simply recognizing reality. "Not to legalize it would be unnecessary torture for some people," he said. In recent years, Uruguay has also moved to allow adoption by gay couples and openly gay people to serve in the armed forces. 4. He's not afraid to confront corporate abuses, as evidenced by the epic struggle his government is waging against the American tobacco giant Philip Morris. A former smoker, Mujica says that tobacco is a killer that needs to be brought under control. But Philip Morris is suing Uruguay for $25 million at the World Bank's International Center for Settlement of Investment Disputes because of the country's tough smoking laws that prohibit smoking in enclosed public spaces and require warning labels, including graphic images of the health effects. Uruguay is the first Latin American country and the fifth nation worldwide to implement a ban on smoking in enclosed public places. Philip Morris, the largest cigarette manufacturer in the United States, has huge global business interests (and a well-paid army of lawyers). Uruguay's battle against the tobacco Goliath will also have global repercussions. 5. He supported the legalization of abortion in Uruguay (his predecessor had vetoed the bill). The law is very limited, compared to laws in the US and Europe. It allows abortions within the first 12 weeks of the pregnancy and requires women to meet with a panel of doctors and social workers on the risks and possible effects of an abortion. But this law is the most liberal abortion law in socially conservative, Catholic Latin America and is clearly a step in the right direction for women's reproductive rights. 6. He's an environmentalist trying to limit needless consumption. At the Rio+20 Summit in 2012, he criticized the model of development pushed by affluent societies. "We can almost recycle everything now. If we lived within our means -- by being prudent -- the 7 billion people in the world could have everything they needed. Global politics should be moving in that direction," he said. He also recently rejected a joint energy project with Brazil that would have provided his country with cheap coal energy because of his concern for the environment. 7. He has focusing on redistributing his nation's wealth, claiming that his administration has reduced poverty from 37% to 11%. "Businesses just want to increase their profits; it's up to the government to make sure they distribute enough of those profits so workers have the money to buy the goods they produce," he told businessmen at the US Chamber of Commerce. "It's no mystery--the less poverty, the more commerce. The most important investment we can make is in human resources." His government's redistributive policies include setting prices for essential commodities such as milk and providing free computers and education for every child. 8. He has offered to take detainees cleared for release from Guantanamo. 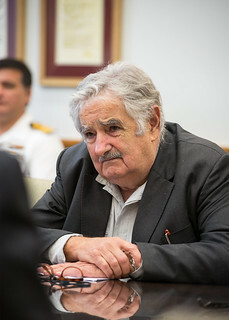 Mujica has called the detention center at Guantanamo Bay a "disgrace" and insisted that Uruguay take responsibility to help close the facility. The proposal is unpopular in Uruguay, but Mujica, who was a political prisoner for 14 years, said he is "doing this for humanity." 9. He is opposed to war and militarism. "The world spends $2 billion a minute on military spending," he exclaimed in horror to the students at American University. "I used to think there were just, noble wars, but I don't think that anymore," said the former armed guerrilla. "Now I think the only solution is negotiations. The worst negotiation is better than the best war, and the only way to insure peace is to cultivate tolerance." Mujica's influence goes far beyond that of the leader of a tiny country of only 3 million people. In a world hungry for alternatives, the innovations that he and his colleagues are championing have put Uruguay on the map as one of the world's most exciting experiments in creative, progressive governance.